Iranian President Mahmud Ahmadinejad's appointments of special envoys for foreign affairs is seen as a direct challenge to the country's supreme leader, Ayatollah Ali Khamenei. Decisions on foreign policy issues -- including the contentious issue of Iran's nuclear program -- are traditionally subject to the supreme leader's approval. However, four appointments made by the president in recent weeks suggest that he intends to exert greater influence on Iranian diplomacy, and could be trying to wrest outright control from Khamenei in the sphere of foreign policy. Special presidential envoys for foreign policy are not without precedent -- President Mohammad Khatami, for example had two such envoys. The difference is that under Khatami, the appointment of envoys was decided by consensus and subject to approval by the president's cabinet, while Ahmadinejad appears to be making appointments unilaterally. On August 22, Ahmadinejad appointed his highly controversial chief of staff, Esfandiar Rahim Mashaei, as his special envoy to the Middle East. Hamid Baghei, the head of Iran's Cultural Heritage Foundation, was appointed as special envoy for Asia affairs. Deputy Foreign Minister Mohammad Mehdi Akhundzadeh has been named Iran's envoy on Caspian Affairs. And Abolfazl Zohrevand, deputy head of Iran's Supreme National Security Council, is now the president's envoy to Afghanistan. 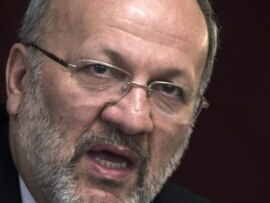 The appointments have been criticized as a blow to Iran's Foreign Ministry and Foreign Minister Manuchehr Mottaki, who believed to owe his appointment to Khamenei and is considered one of the few remaining so-called pragmatists in the Iranian government. On September 7, Mottaki warned against the "weakening of Iran's diplomatic apparatus," while the Foreign Ministry has denied reports that Mottaki was prepared to resign over the situation. Tehran-based analyst and journalist Hassan Fathi says Ahmadinejad wants to demonstrate that he can act independently from the supreme leader. Fathi adds that Mottaki has the support of Khamenei. "The Foreign Ministry is one of those places -- like the Intelligence Ministry -- that has been always monitored by Khamenei, who has placed loyalists there, including Mottaki," Fathi says. "For example, when Mottaki goes on a mission, he first reports to Khamenei, then to the cabinet." This is not the first time Ahmadinejad has challenged Khamenei. For example, in 2009 he refused to rescind his appointment of Mashaei to the position of vice president, which Khamenei objected to. Mashaei later resigned himself and Ahmadinejad gave him several other posts, including chief of staff. Ahmadinejad has also called for a debate with U.S. President Barack Obama, despite Khamenei's criticism of officials who suggest the possibility of negotiations with the United States. In Washington, Iran analyst Rasool Nafisi says Ahmadinejad is trying to "go over the head" of Khamenei, and to lay the groundwork for "a more free hand" for himself in foreign policy. Khamenei indirectly blasted Ahmadinejad's decision in an August 30 meeting with the Iranian cabinet, during which he warned against parallel activities in different areas -- including foreign policy. "Another management point [that should be observed] by the cabinet is that duplication in various fields, including in the foreign-policy arena, must be avoided and ministers should be trusted within the framework of their authorities and responsibilities," Khamenei was quoted as saying. Other figures within the Iranian establishment have also criticized the move -- including the parliament's speaker, Ali Larijani, who questioned the rationale behind it. On September 7, 122 legislators in Iran's 290-seat parliament called Ahmadinejad's move "illegal" and warned against duplication of foreign-policy roles. Several lawmakers have said Ahmadinejad should remove his envoys and not interfere with the supreme leader's traditional oversight of foreign-policy matters. The envoys have come under criticism by lawmakers for their lack of diplomatic experience. The most controversial choice is Rahim Mashaei, who has angered hard-liners and the president's allies in the past over actions and comments deemed anti-Islamic, including conciliatory remarks about Israel. Ahmadinejad appears to be indifferent to the criticism, and reports emerged this week that he is getting ready to introduce more special envoys. Baghaei was quoted by Iranian official news agencies on September 6 as saying that the Iranian president is set to appoint two more envoys, one for African affairs and another for South America. Fathi says he's not surprised, as Ahmadinejad "has demonstrated that he's not into making compromises, he's stubborn, obstinate, and persistent. I don't think he's going to back off or cooperate with other bodies in this regard." Nafisi, who believes "Ahmadinejad's persistence" has been a trademark of his presidency, says the Iranian president appears to be weighing his options. "He only retracts if he feels that he cannot go any farther, like in the case of allowing women into soccer stadiums," he says. "When he saw the tremendous [backlash], he couldn't go forward anymore. He retreated." Looking at the bigger picture, Nafisi says the combative Ahmadinejad is trying to distance himself from the clerical establishment and from Khameni, and to push for a new style of presidency with an eye to Iran's future presidential vote. There is increasing speculation that Ahmadinejad could try to retain power by supporting the candidacy of one of his closest aides; namely, Mashaei. Meanwhile, observers predict that Iran is positioned to face more domestic and international tensions in the near future. Only days following his appointment as Ahmadinejad's envoy to Asia, Baghaei created a diplomatic uproar when he said that that mass killings and deportation of Armenians by the Ottoman Empire constituted "genocide." Turkey demanded a high-level explanation from Tehran and Mottaki reportedly told his Turkish counterpart that Iran's position was in line with Turkey's. Nafisi believes there could be more such diplomatic rows in the future. "It seems to be that this group of Ahmadinejad and his clique would be even more crisis-prone. Even, say, Mottaki and Velayati [Khamenei's adviser on international affairs, Ali Akbar Velayati] and others who are closer to the office of Ayatollah Khamenei."